Description - Combining the durability of modular tiles with the warmth of carpet, our Carpet-Loc tiles can be used in areas where standard carpet will not make the cut. These carpet tiles feature pegs that raise your tiles above any dampness, and provide space to cover small cords. You will also have a vented surface underneath your tiles allowing instant drainage and airflow. With an easy snap together installation, you will find these tiles in both residential and commercial spaces. Material – Polyolefin carpet tile inserted into a high impact polypropylene base. Weight – Each tile weighs approximately 1 Lbs. Recommended Uses - Our Carpet-Loc tiles have been used as carpet in exercise rooms, aerobic rooms, basements, laundry rooms, trade shows, indoor pools, bedrooms, and much more. 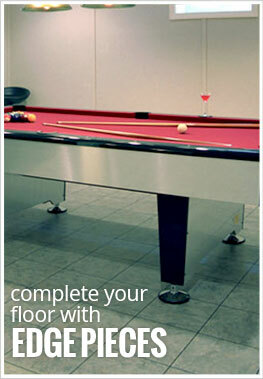 Carpet-Loc Tiles can be maintained just like your carpet at home. Vented for quick drying of spills. Will cover wires with a gauge up to 3/16".